Here's what coexistence means to Muslims. 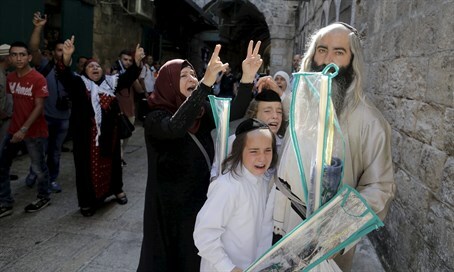 A hassidic child cries, clinging to his father's hand as an angry mob hounds them, hurling anti-Semitic abuse. Scenes not from Europe in the early twentieth century, but from the streets of Jerusalem's Old City on Sukkot, 2015. Muslims in the holy city have been rioting for more than two weeks now, clashing with police and attacking Jewish residents. Several people have been injured and one man - 64-year-old grandfather Alexander Levlovich - was murdered by Muslim terrorists who hurled rocks at his car, causing a fatal crash. Arab Muslim rioters claim their actions are in order to "protect" the Al Aqsa Mosque on the Temple Mount from Jewish "invasions"; Jews note such "invasions" are merely peaceful visits to the Temple Mount (not even the mosque itself), which is Judaism's holiest site, and that the violence is meant to prevent them from visiting the Mount and even to drive from the Old City altogether.